SpaceX just keeps pumping out launches with the latest seeing a Qatari communications satellite lift off from one of the most historic launch pads in the world and delivered into a geostationary transfer orbit. Lifting off from Kennedy Space Center‘s Launch Complex 39A, the SpaceX Falcon 9 carrying the Es’hail 2 communications satellite cleared the tower shortly after the opening of the mission’s launch window at 3:46 p.m. EST (19:46 GMT) Nov. 15, 2018. The Falcon 9 Block 5’s nine Merlin 1D engines ignited shortly before liftoff, which occurred three seconds later. The vehicle and its payload, climbing on 1.71 million pounds (7,065 kilonewtons) of sea-level thrust, lifted off into the partly-cloudy sky and angled out over the Atlantic Ocean. The vehicle continued to build speed, reaching the moment of maximum dynamic pressure—the time when the forces exerted on the rocket by the thrust of the engines, combined with the pressures of the thinning, but still substantial atmosphere, are greatest—66 seconds after leaving the pad. The Merlin engines continued to fire for nearly another 90 seconds, propelling the vehicle to an altitude of 40 miles (65 kilometers) and a speed of 5,226 mph (8,410 kph), before shutting down, followed by stage separation approximately 4 seconds later. The first stage, now in a relatively ballistic trajectory, began orienting itself for its entry burn. The second stage, meanwhile, started its lone Merlin 1D Vacuum engine to continue in its mission to deliver the Es’hail 2 communications satellite to orbit. The Merlin engine, capable of producing 205,000 pounds (914 kilonewtons) in its vacuum configuration, began to glow from the heat of combustion as the vehicle and payload continued to accelerate. Once clear of the thick atmosphere, and no longer needing the thermal and acoustic protection provided by the payload fairing, the aerodynamic shell was was discarded 3 minutes, 47 seconds after liftoff. As the second stage and its satellite continued building speed, the first stage initiated its entry burn. Meant to shed speed, and the accompanying stresses the booster would encounter as it plowed through the ever-thickening atmosphere, the 20-second engine firing started slowing the booster on its descent to the waiting droneship—“Of Course I Still Love You”—in the Atlantic below. Once reaching its nominal parking orbit, the second stage’s Merlin engine was shut-down for the first time—an event known as SECO-1—8 minutes, 7 seconds after liftoff. Nearly simultaneously, and hundreds of miles away, the first stage re-ignited a subset of its Merlin engines and performed a near-bullseye landing on the droneship. 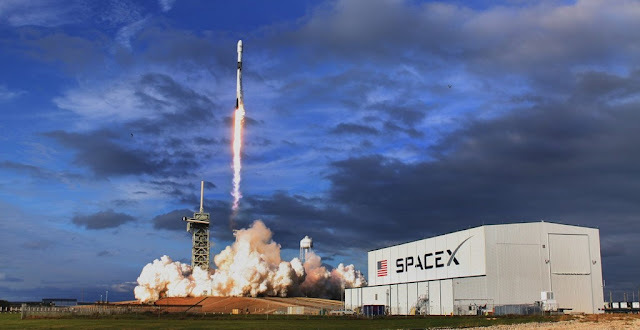 Currently, SpaceX is the only launch provider recovering a significant portion of its launch vehicle, and it has been a mainstay of its launch operations. Indeed, the Falcon 9 used for this mission had already flown once before on the Telstar 19V mission in July 2018. With the booster safely landed, attention refocused on the primary mission: the delivery of the Es’hail 2 satellite to orbit. The second stage, with its attached satellite, entered a nearly 18-minute, 30-second coast phase. Following the coast, the Merlin was once again ignited for a nearly minute-long burn to set the payload on its intended trajectory. Five minutes later, SpaceX completed its part of the mission when the Es’hail 2 satellite separated from the second stage and floated free from the vehicle. It took the Falcon 9’s two stages about 32 minutes to transport the 11,686-pound (5,300-kilogram) satellite from Florida’s Atlantic coast to a geostationary transfer orbit with a high point of nearly 26,200 miles (42,165 kilometers) above Earth’s surface. The flight, booster recovery, and satellite insertion were all what has become a staple of SpaceX’s business model—the launch and recovery of an orbital-class booster while delivering the customer’s payload to orbit at an industry-leading price. Es’Hail 2 will be operated by Es’hailSat, Qatar’s Satellite Company, once it reaches its geostationary orbit. Upon reaching its destination, it will reside at the 26 degree East position and provide TV broadcasting services that should significantly add to the company’s ability to provide high quality, premium direct-to-home television content across the Middle East and North Africa.